In an update to its official website late Thursday, Apple's new SVP of Retail and Online Stores Angela Ahrendts was placed on the Apple Leadership roster, signaling her official entry into the company. 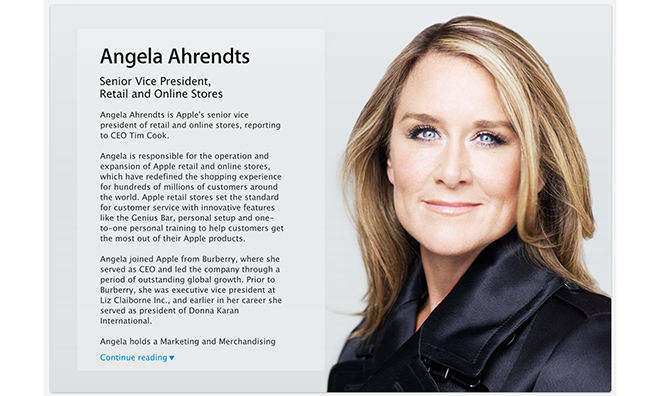 Alongside the usual headshot, Ahrendts' short bio notes the retail chief will be reporting directly to Apple CEO Tim Cook, who has been temporarily leading the company's retail group for over a year. Filling the spot vacated by John Browett in October 2012, Ahrendts will not only be in charge of brick-and-mortar locations, but will take on responsibility for Apple's Online Store. This expansion of duties gives the former Burberry CEO significant sway over Apple's incredibly lucrative retail operations. Ahrendts has a strong background in retail leadership especially as it applies to fashion, having served as executive vice president at Liz Claiborne and president of Donna Karan International. Angela holds a Marketing and Merchandising degree from Ball State University in Indiana, where she was awarded an honorary doctorate in 2010. She is also a member of the UK's Prime Minister's Business Advisory Council and was named honorary dame commander of the British Empire in April 2014. Ahrendts comes to Apple at a pivotal time as the company ramps up for a major retail push in Asia, specifically China where the potential for growth is enormous. Over the next two years, Apple plans to triple the number of Apple Stores in Greater China, adding 26 new outlets to the region by 2015. Prior to today, it was not known when Ahrendts would officially join Apple in Cupertino. During Apple's quarterly earnings conference call last week, Cook hinted that the new head of retail would start work soon, saying "I'm looking forward to welcoming our new retail and online leader, Angela Ahrendts, who will be joining Apple's Executive Team next week."